It added that Israel uses the absence of such plans to deny construction permits filed by the Palestinians, leading to “extreme housing shortage,” in addition to impacts of these policies on the Palestinians who lack public buildings, including schools, hospitals and clinics, and community centers. 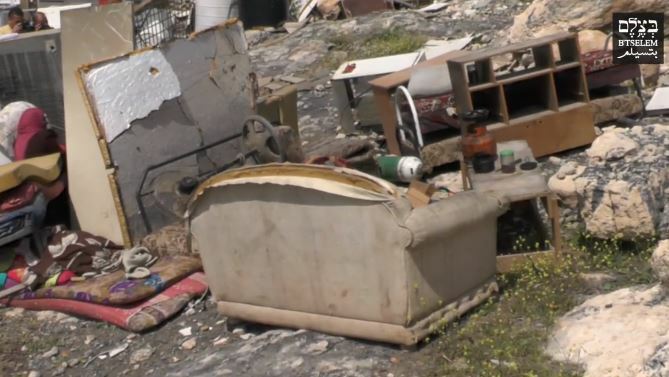 In addition, B’Tselem said that, faced by the absence of legal means that enables them to construct homes and other facilities, the Palestinians have no choice but to build without construction permits, and in turn; the Israeli Authorities demolish a large number of the constructed buildings. The Israeli human rights group said Israel demolished 141 Palestinian homes in Area C of the occupied West Bank, under full Israeli civil and military control, rendering 715 Palestinians, including 386 children, homeless. It added that Israel demolished 47 homes in occupied Jerusalem alone, rendering homeless 167 persons, including 77 children. —- Area C covers 60% of the West Bank and is home to an estimated 180,000-300,000 Palestinians and to a settler population of at least 325,500 living in 125 settlements and approx. 100 outposts. Israel retains control of security and land-management in Area C and views the area as there to serve its own needs, such as military training, economic interests and settlement development. Ignoring Palestinian needs, Israel practically bans Palestinian construction and development.